The jury in the trial of a parish priest accused of sexually abusing a string of boys over nearly 30 years has retired to consider their verdicts. The Rev David Smith, 52, of St John's Road, Clevedon, Somerset, allegedly groomed and then molested a succession of vulnerable youngsters in his care. Mr Smith denies 12 charges allegedly committed against six boys aged under 16 between 1976 and 2005. Two indecency charges were dropped for legal reasons. Mr Smith is accused of 10 charges of indecent assault, one sexual assault on a child under 13, and one of sexual activity with a child under 16. 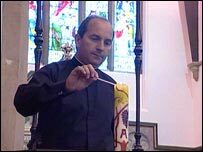 He has been suspended from his role as vicar of St John the Evangelist in Clevedon pending the outcome of the case.